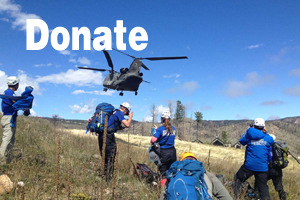 Rocky Mountain Rescue Group is an all-volunteer organization trained and equipped for search and rescue on mountainous terrain and in all weather conditions. Founded in 1947, we are one of the oldest and most experienced mountain rescue teams in the country. We are Boulder County's primary mountain rescue agency, but upon request also assist other mountain rescue teams outside the county. RMRG is a non-profit IRS 501(c)3 organization and we do not charge for our services. RMRG depends on your donations to provide a significant portion of our budget. Please consider giving a donation. We pride ourselves on an efficient operation and low cost to the community. Donations are tax-deductible as charitable contributions.